Audi A6 Saloon Interior, Sat Nav, Dashboard | What Car? As with the BMW 5 Series, the A6's pedals are a little offset to the right, but unlike its compatriot, you get electric lumbar adjustment as standard and a fully electrically adjustable driver’s seat. That gives you loads of tweaking capability, which, combined with generous steering wheel rake and reach adjustment, means you should have no issues getting comfortable before a trip. Even after a long motorway drive, you shouldn't have any twinges, although a brisk back-route blast might have you wishing for a tad more side support during cornering. As standard, you get clear analogue dials, but add the Technology Pack and these are replaced by digital dials on a 12.3in screen. They're excellent, doing more than analogue dials by being highly configurable and showing a wealth of useful information just below your sightline. In fact, they make the optional head-up display a worthwhile extra but not one that's an absolute must. There’s another 8.6in touchscreen dedicated to climate control and convenience features. However, while it provides haptic feedback to confirm when you’ve touched an icon, we’re not sure what it achieves other than looking good. In fact, it’s actually a bit of a pain, doing away with physical buttons that you can navigate by memory and feel and forcing you to take your eyes off the road to make adjustments. It feels like a backwards step in ergonomics. You won’t struggle to see out of the A6. Its front pillars are thinner than many of its rivals' and its generous rear quarter windows really open up your over-the-shoulder vision. The 5 Series is also pretty good in this respect, but the E-Class's thicker rear pillars rather spoil your view when reverse parking. 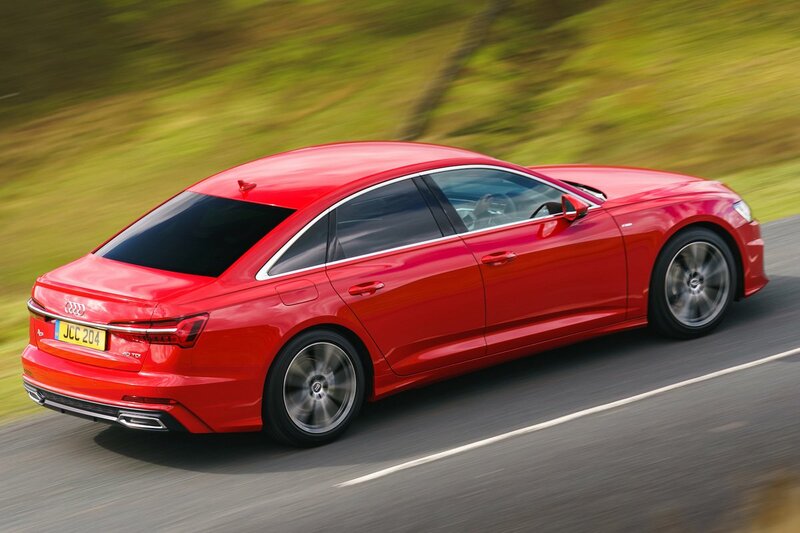 To make matters even easier, all A6s get front and rear parking sensors as standard, as well as a rear-view parking camera. You also get LED headlights as standard, and in S line trim they are clever adaptive units that allow the main beams to remain on without dazzling oncoming cars. 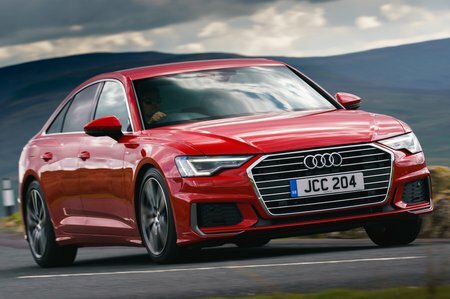 Audi’s latest generation of infotainment system swaps a rotary controller (like BMW’s iDrive) for a touchscreen with haptic feedback, and we reckon it’s a retrograde step. For a start, the touchscreen diverts attention from the road more than using a physical wheel to scroll through menus, and the menus themselves are also less intuitive than those of the 5 Series. On the plus side, the screen is sharp. As standard it's 8.8in diagonally across, but if you add the Technology Pack, the upgrades include a larger 10.1in screen. 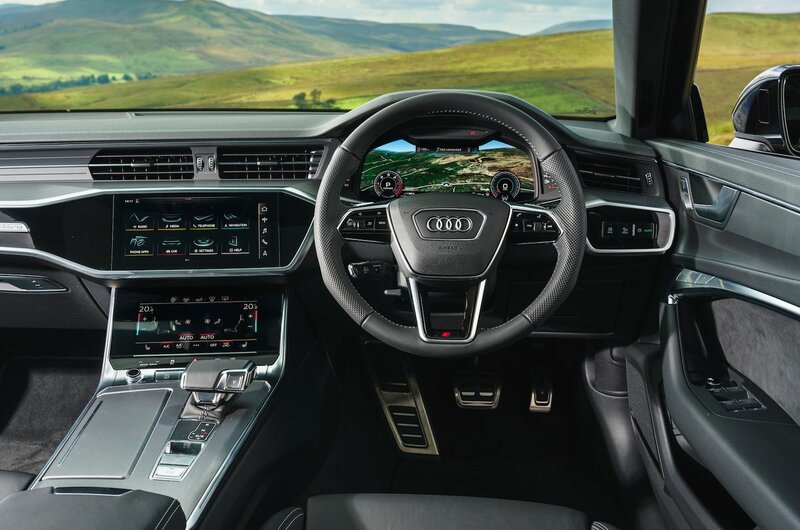 Standard functionality includes sat-nav with live traffic information and a 10GB flash memory for music storage, while Technology Pack upgrades include wireless charging, 3D mapping and Google Earth, along with natural voice recognition software. We were impressed by the standard 10-speaker hi-fi, which sounds clear and punchy, but for music lovers there are two options: a reasonably priced Bang & Olufsen premium sound system with 730 watts and 16 speakers, or a 19-speaker, 1920-watt Bang & Olufsen system that costs as much as some entire city cars. The A6 has a cleanly designed interior with a tremendously high level of build quality, so everything you touch feels like it'll last. The materials used look very expensive, too, with lots of real aluminium trim highlights, which you can swap for fine-grain ash wood at extra cost if it’s more to your taste. At night, ambient lighting adds to the car's crisp, modern look, and you can also have the entire interior swaddled in leather, should your budget stretch to it. Our only slight criticism, which is perhaps quite subjective, is that the interior is a little short on character next to what some would argue is the more indulgent interior of the Mercedes E-Class.